Many questions were raised about the new stormwater fee during a recent public information session, which ran for more than four hours and drew approximately 70 attendees. The Times Leader has compiled a synopsis of some of these inquiries and responses in the interest of public education. At the session, answers were supplied by: Wyoming Valley Sanitary Authority Executive Director James Tomaine and other authority officials; authority consultants Adrienne Vicari and Mark Spatz, of Harrisburg-based Herbert, Rowland & Grubic Inc., or HRG; and Paul Grella, of the state Department of Environmental Protection, or DEP. The controversial fee stems from the decision of 32 municipalities to participate in a regional stormwater pollution reduction project handled by the sanitary authority. These municipalities must reduce sediment, nitrogen and phosphorus washed into the Susquehanna River, and ultimately the Chesapeake Bay, over the next five years. Due to a public outcry, the authority has delayed the fee payment due date to March 15, eliminated all appeal fees for those contesting the authority’s calculations, increased some bill discounts and reduced the charge for properties with 7,000 square feet or more of nonabsorbent impervious area, or IA. Q: Which municipalities must comply? A: Municipalities requiring MS4 (municipal separate storm sewer system) permits through the state because they have both urbanized areas determined by U.S. Census data and separate storm sewer systems. Separate storm systems mean stormwater is not mixed with wastewater, and thus is discharged directly into waterways without first being treated. Q: Is this the only area with MS4 permits? A: No. Permits are required across the country and issued by each state agency. Grella said there are approximately 2,000 MS4 permits in Pennsylvania, including 177 in his 11-county Northeast Pennsylvania region. The authority is taking a “proactive approach,” but compliance initiatives have been implemented or are underway in other parts of the state, he said, noting his agency supports regional compliance programs. ”We’re going to start to see this all over the state,” Grella said. Q: How did the stormwater mandate originate? A: In 1981, several states in the Chesapeake Bay Watershed, including Pennsylvania, signed a compact to clean up the bay. Maryland is “not out of it” and still required to participate. After years of inactivity, the first MS4 permits were launched in 2002. The Pennsylvania Department of Agriculture filed a legal challenge that ended up in the Supreme Court but lost in 2012. In 2013, the municipal MS4 permits started taking effect. The federal Environmental Protection Agency (EPA) is administering the mandate because it falls under federal guidelines and crosses state lines. Grella said the MS4 permits fall under federal regulations that also cover discharge permits for wastewater treatment plants, construction projects and large farming and industrial operations. Q: Why should properties in non-urban sections of each municipality be on the hook? A: The amount of pollution that must be reduced is tied to the urbanized area, but the MS4 permits also include some municipal-wide requirements, including mapping of all stormwater catch basins, swales and pipes. Q: Why did the authority decide to get involved in stormwater management? A: The authority received requests from municipalities throughout the region due to its experience with pollution reduction and servicing multiple municipalities. 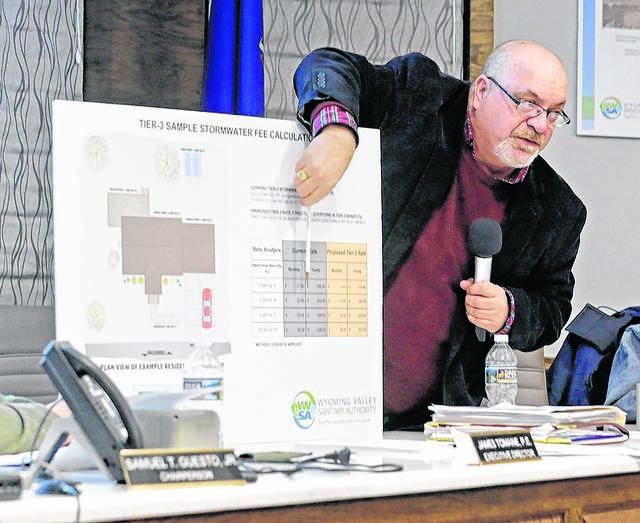 There was some desire at the state level for county governments to handle oversight, but Luzerne County did not choose to handle it. Note: County Manager C. David Pedri said nobody ever approached him about handling oversight as manager or in his previous role as chief county solicitor. Several council members also said the issue was never presented to them. Q: How did the authority come up with the nonabsorbent impervious area (IA) used as a basis for the fee payments? A: An aerial map of more than 200 square miles was generated using high-resolution photography and lidar (light detection and ranging) technology. With lidar, light pulses are sent from an aircraft, and variations are calculated by measuring the pulses that bounce back. The federal government and national experts are pushing for data to be collected this way because it is so precise. The authority’s consultant said it can classify what’s on the ground, including trees, buildings, sidewalks and macadam. To carve out property boundaries, the authority laid county real estate assessment maps atop the aerial ones. Q: Why are some boundary lines off? A: The parcel boundary lines on the county maps are not all based on surveys. Fee payers can request a free authority review if they believe their measurements of impervious area are inaccurate. Q: Why wasn’t property data made more accurate? A: Authority officials and their consultant determined it would cost millions of dollars to independently compile parcel boundary maps due to the high number of parcels. Q: Will properties in tax-forgiveness programs, such as Keystone Opportunity Zones (KOZs) and Local Economic Revitalization Tax Assistance (LERTA) programs, be required to pay the fee? Q: Can the authority offer additional discounts beyond new ones recently approved? A: Tomaine said there is a limit to lowering rates because fee revenue must cover retention basin sediment reduction projects, mapping, catch basin cleaning and other work to meet permit requirements. Q: Will residential fee payers receive new bills incorporating recently approved fee alterations? A: No. Changes will be incorporated in the next billing. Those who already paid the full-year fee will receive notices they have a credit and will have the option to receive a refund or apply the savings to next year’s bill. Q: What is contaminating the stormwater going into waterways? A: “Mankind. Without us, these streams would be fine,” consultant Spatz said. He pointed to a map of red lines showing local polluted creeks and streams, with a photograph showing one that was clear before it passed through an urban area. Q: Why not wait for implementation? A: Grella said his agency and EPA may be forced to start imposing fines if municipalities are not complying. The MS4 permits are in their third renewal cycle, and the current one is the first to set a specific quantity of pollutants that must be reduced. The authority said it was denied an extension to comply, and the consultant said all pollution reduction plans must be in place in 2023. Q: Why have many municipalities failed to maintain stormwater systems, including catch basins filled with debris and in at least one instance vegetation growth? A: Many have deferred maintenance due to a lack of funds, and the impact may only be visible when it rains hard and streets start flooding. Q: While sediment removal can be quantified, how will the government know if pollution is reduced for projects designed to prevent or screen out sediment or pollutants? A: Grella said municipalities must prepare plans based on scientific and mathematical modeling standards to meet required percentages. If state-approved projects are completed as required and maintained, the state will assume they are performing as projected, he said. Q: Why don’t Lake, Ross and Hunlock townships and some other area municipalities have to pay? A: Grella said they have no urbanized areas as determined by the Census. Q: Is it too late for municipalities to seek a waiver from DEP to avoid participation? A: Grella said DEP would probably consider such requests, but municipalities would have to provide new information or show that something has changed since the original permit paperwork was submitted. One of the factors is whether there are less than 1,000 people in an urbanized area, based on the Census, he said. Q: What’s the sense of undertaking these projects when another Susquehanna River flood could bring houses, sediment, oil and propane tanks and other pollutants into the waterway and eventually the bay? A: Grella said floods are not “everyday” events. He also addressed the “misconception” that the mandate is only for the Chesapeake Bay, saying it also is intended to clean up locally impaired creeks and streams. Municipalities in the Pittsburgh and Philadelphia areas, for example, also must meet MS4 requirements for their watersheds. Q: Why haven’t commercial property owners received their stormwater bills? A: Tomaine said commercial bills normally lag behind to obtain water usage readings for their sewage charges, but their stormwater fees took effect the same date as residential ones, or Jan. 1. The commercial bills also will incorporate the recent stormwater fee changes approved by the authority. Q: A paved parking lot or inclined surface creates more runoff than a gravel or flat one, so why weren’t runoff coefficients applied to weight impervious surfaces? A: The MS4 program is a “binary system” in which land is classified solely as pervious or impervious. The consultant noted that while gravel surfaces may create less runoff, they also release more sediment, which also must be reduced. Q: What is the budget for the stormwater program? A: The $8.88 million stormwater budget for 2019 is posted on the authority’s website, www.wvsa.org, under the regional stormwater management link. Q: What projects does the authority propose completing to meet the mandate? A: The compliance plan, which is awaiting state DEP approval, also is posted on the stormwater section of the website. 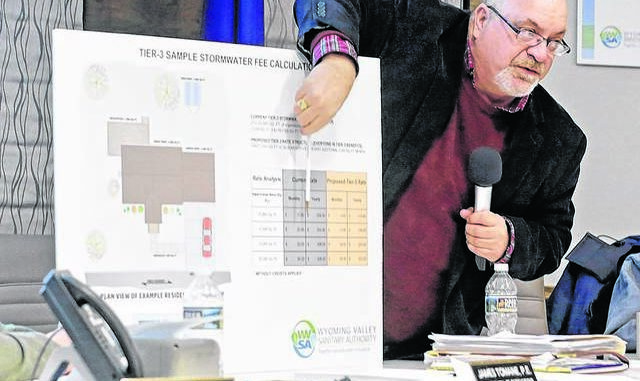 Wyoming Valley Sanitary Authority Executive Director James Tomaine explains the stormwater fee calculation during a recent public information session in Hanover Township.